Design studio Splinterworks has created a sculptural waterslide that is designed to mimic the barrel-shape of a wave before it breaks. Called Waha, the waterslide takes its name from a term given by surfers to describe the hollow portion of a wave that appears like tube or barrel. "The elegant design was inspired by surfing a waha – the shape appears to gather momentum and reaches a crescendo, which then circles back in on itself," said Splinterworks. 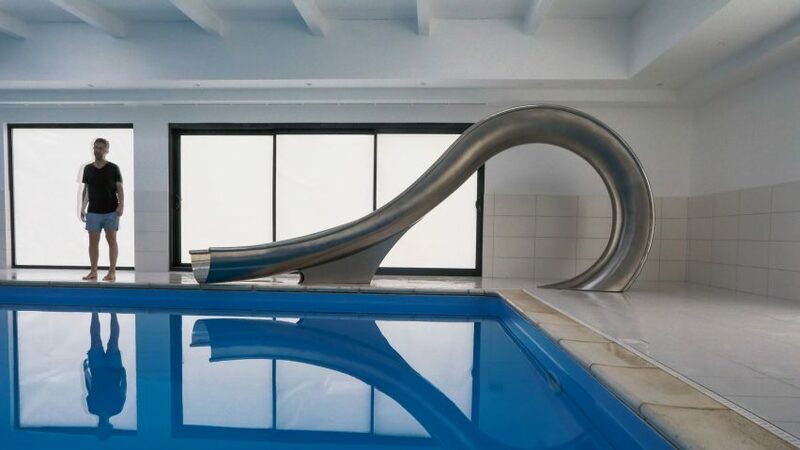 Intended as an add-on to existing swimming pools, the Waha is the company's first standardised water slide. It is made from sheets of stainless steel that have been hammered into shape and welded together to form a tubular form. To create a contrast, the designers used a mirror-polished finish on the interior while the exterior is brushed. "Polished stainless steel doesn't get too hot to touch, even in sunny climates," the UK-based designers explained. "In fact, it actually reflects sunlight and thermal energy as it doesn't oxidise like other metals." Made from a single streamlined curve shape, the foot of the curve constitutes the steps that take the user to the top of the slide. The slide itself then loosens and turns in on itself. The Waha slide is available in a range of sizes and finishes, including mirrored, brushed or enamelled in colour. There is also an option to have water jets inserted into the inner surface of the slide. "We wanted to make a something fun and beautiful; that is just as appealing to kids as it is to grown-ups, and if that is for different reasons we are happy with that too!" said the designers. "Having made static design objects for 10 years, it is now really fun to create objects that are dynamic, that you can physically move through and that are capable of sparking emotions and feelings," they continued. "Shrieks and giggles are what we aim for!" Slides are more frequently being used for adult entertainment or as alternatives to staircases. Belgian artist Carsten Höller is well known for building gigantic slide structures around the world, from a duo of twin slides in a renaissance palace in Florence to a massive slide tower at a shopping mall north of Miami.